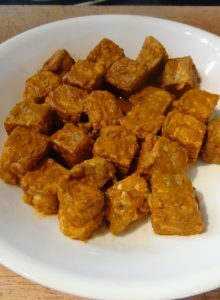 It is important to marinate tempeh for creating very tasty tempeh recipes. It is simple to do and this marinated tempeh is delicious. First, you need to steam it. Tempeh is vacuum sealed and ready-to-eat, but it is good to steam it. It can have a somewhat bitter flavour so steaming it will help to remove that bitterness and make the tempeh softer and easier to work with. Also, the steaming opens its pores making it absorb the marinade and seasonings better. Next, cut up the tempeh. Choose a shape to cut the tempeh into considering the recipe you will be preparing. You can slice, chop, cube, shred or crumble it. When you shred or crumble it, this will give the tempeh the texture of ground which is great for chilis, soups, sauces, tacos, burgers, and veggie meatballs. Sliced tempeh into long strips is good for barbecued tempeh or for salads. Cut in cubes for salads and stir-fries. Thin rectangles are good for sandwiches. Steam the tempeh for 10 minutes. 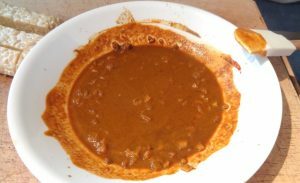 Combine all of the marinade ingredients in a small bowl and whisk them together. Choose a shape to cut the tempeh into. Now place the tempeh in a dish with a lid or cover it. Pour the marinade over the tempeh, cover it with a lid, and place it in the fridge to marinate for 2 to 8 hours. When you’re ready to create a recipe with it, drain the marinade if there is any to drain and pat the tempeh dry. Now you have a number of options and recipes to make with this tempeh now that it is flavoured. Add the cooked tempeh to a fresh salad, have it on the side with quinoa or another whole grain, make a stir fry or tempeh burgers. Check out the recipes below. Yum! 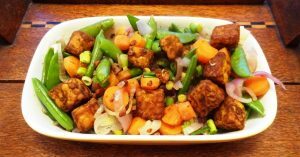 Tempeh Sauteed with Spices and Garlic For a Special Vegan Dinner -This tempeh sautéed with spices is a super easy dish to add to any vegan dinner. 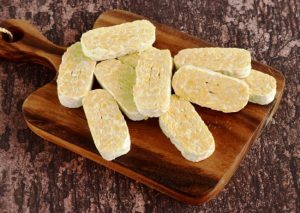 Tempeh is firmer and tastier than tofu with its nutty taste and texture and it is much healthier too making your meal full of easy to digest protein and vitamin B12. All the ingredients in this meal are very healthy. 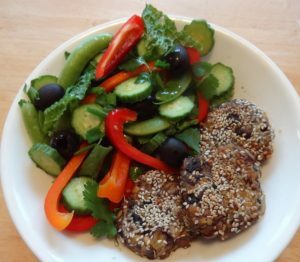 Tasty Tempeh Burgers are Vegan and Gluten-free– These tempeh burgers are tasty and a very good source of protein for dinner. You can make them into burgers with buns or what I do is have them with a salad or steamed vegetables. Thank you for the recipe. I have always been curious about tempeh. I have worked with tofu before and tried a few recipes but never tempeh. I look forward to trying this one as well as your other tempeh recipes. You are welcome, this is a very good way to get started with tempeh. Look forward to hearing what you made with it.